New construction of 20 condominium units on “N” Street, just a block back from the south end of Ocean Boulevard. The four-story building consists of three floors of single-level condominiums over a single story, heated secure parking garage providing two spaces per unit. 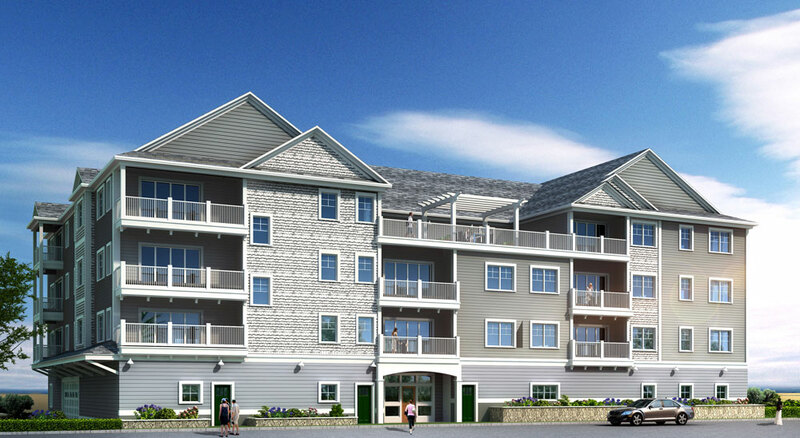 The building exterior will consist of pitched roofs with exterior decks, a common rooftop deck, vinyl siding, and trim elements in a contemporary New England design. All of the 20 units were designed as two bedrooms/two bathroom units. Each unit features numerous amenities including hardwood and ceramic flooring and granite countertops. Each master suite includes walk-in closets, tiled showers, and dual sink vanities. The second bathrooms are full with 1-piece tub/shower units. Other design features include exterior decks at each unit accessed by a large double sliding glass door, in-unit laundry room with utility sinks, generous closet space and in-unit central heating and air conditioning. Common building features include on-site trash room, pervious pavement open parking, central elevator, individual unit storage space at the garage level for convenient access to all the beach “toys”, and a large pergola-covered roof deck for enjoyment by residents and guests. The layout of the units was configured to maximize the potential views of the ocean. The project’s proximity to the ocean requires the building to be supported by rammed aggregate “geopiers”, a highly engineered subsurface structural support system designed and installed by Helical Drilling. Construction Management contract included pre-construction services and complete site development including rammed earth GeoPier ground stabilization system.